Chronic intermittent hypoxia (CIH), a characteristic of obstructive sleep apnea (OSA), has been linked to hypertension and an increased cardiovascular risk (Quan and Gersh 2004). Patients with recently diagnosed OSA show potentiated ventilatory and cardiovascular responses to acute hypoxia, attributed to an enhanced carotid body (CB) reactivity to hypoxia (Narkiewicz et al. 1998). Similarly, animals exposed to CIH show enhanced ventilatory (Reeves et al. 2003; Rey et al. 2004) and cardiovascular (Fletcher 2001) responses to hypoxia. Moreover, Peng et al. 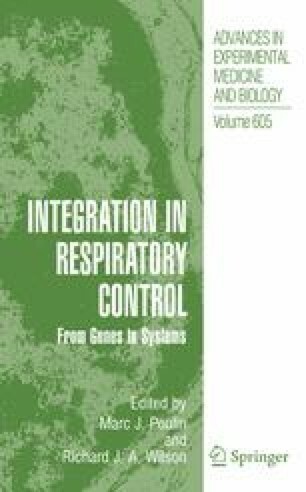 (2001) found that basal CB discharges and chemosensory responses to acute hypoxia were larger in rats exposed to a CIH pattern consisting of short cyclic hypoxic episodes followed by normoxia, applied for 8 hours during 10 days. Using a similar protocol, we found that cats exposed to cyclic hypoxia followed by normoxia during 8 hours for 4 days showed enhanced CB chemosensory and ventilatory responses to acute hypoxia (Rey et al. 2004). Since the CB is a highly vascularized organ, it is possible that factors produced by the endothelium may control the CB vascular tone by modulating the PO2 tissue level. In fact, endothelium-derived reactive oxygen species have been implicated as mediators of the CIH-induced potentiation of hypoxic CB chemoreception (Peng and Prabhakar 2003). Interestingly, endothelin-1 (ET-1), a potent vasoactive excitatory modulator of CB chemoreception (Rey et al. 2006) and the endothelin receptor type-A (ETA-R) are both upregulated in sustained chronic hypoxia (Chen et al. 2002a; Chen et al. 2002b). However, it is not known whether CIH increases the ET-1 expression in the CB, and if ET-1 contributes to the enhanced CB hypoxic response induced by CIH. Thus, we studied the role played by ET-1 and its receptors in the CIH-induced potentiation of CB hypoxic chemosensory responses.